Club Penguin Cheats by Mimo777 Club Penguin Cheats by Mimo777: Newest Club Penguin Reviewed By You! "My favorite play is The Penguins That Time Forgot. I love the special FX and the costumes. And the script is really good too. And last I like acting in the play with my buddies and having fun! I hope if it returns everyone has as much fun as I did. Waddle On!" Congrats, Odnan! Next weeks Reviewed By You question is: What do you think the ultimate furniture item would be? If Club Penguin chooses your review, you will get 10, 000 coins! Sweet, huh? The Better Igloos catalog will be here next Friday and Club Penguin says it will contain lots of cave items. That's weird! Why would Club Penguin have cave items? Let me know what you think, k? I think a cave might be cool! Maybe we could get cave igloos! PS what are CP MODS? maybe they are making a new party and it might be like the penguins that time forgot and norman swarm has been transformed but all around club penguin! also i think that review is really good. I'm guessing they are going to have a "Cave Party" or a Cave Igloo contest, Or maybe a new famous penguin oh or a new room or something to do with the new mission. Well we'll see what happends. CP Mods Are Moderators On The Game. They Ban People If They Act Inappropriately, And THey Are Adults That Work For CP. Mimo, Are There any Chobot Cheats? I don't know what the cave party is becasue I just recently joined Club Penguin. But, I think it might just be some random new items like the new Penguin style catalog. I could be wrong, but there has been some pretty random things happening in CP! CPG Mods are people who answer people's comments and questions. Check out Mimo's explanation about CPG Mods for more information. Club penguin might have cave items to celebrate the release of an underground party where club penguingets turned upside down. And in the catalog there will be a cave upgrade and dinosaur statues! I think that they maybe are having a party that involves caves somehow. Not sure yet. Could it be a Cave Party, with cave igloos? I liked the tent igloo and i got a diffrent one now. Also maby the water party again. I loved the sea shell belt in the book room. 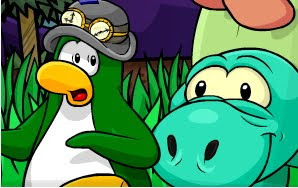 You mean CPG Mods, well CPG = Club Penguin Gang and we are people who answer questions in comments and help others like im doing so now, to learn more about modding go to the CPG homepage and read the text about modding in the sidebar! Hope i could help! If you mean CP Mods they are people who work for the game and they have the power to Ban & Kick you from a server if you break the rules! Kirby: *squeak* I already live in a cave! Oisin: Or mabye the return of Penguins Who Time Forgot! I loved that play! Oisin: Yeah, that would be really cool! Good idea! Kirby: *squeak* I remember when the first caveman came to life! Hey Daz I dont think there is a Mimo Chobot Cheat site but you could ask Mimo to make one! CPG mods stand for Club Penguin Gang moderators. They answer questions on the comments! Anyone can try out to be a CPG Mod! Oisin: Very coolz! What do you think is gonna come? I hope all of Club Penguin will fall into a time machine, and we all go back in time!! ...No clue why there would be cave items! Like, for this website, CPG do you mean? If so they are people who answer comments, like I am now. But if you are talking about regular CP mods, they are people who moniter what you do on Club Penguin, whether this or that is appropriate. Did I help? Ok I checked out some more comments, and now Racet2000 is our bro (a bro right? not sis?) and so is Karate Song? Who else is in? I have, like, missed a lot. (Yikes it's getting full lolz!) Ok, so far I know that Syka, Kkkkkk123, and Polkadotblu9 are my "sisters", Sweetflame12 is a "bro", please tell me if Racet and Karate Song are bros or sis's...Sorry if this is a little long comment! I haven't been on since, like, 20 hours ago! Cp mods are moderators that answer questions on clubpenguingang.com, like me answering this question! When you answer a question, and ONLY when you answer a question, you add CPG MOD at the end. If you answer enough, you might be on the mod board! I REALLY want to be! Yes, and Mimo does put them on clubpenguingang.com. Daz12 said... Are there any Chobot cheats? Mimo dont post Chobot cheats, but he sometimes post when cool new stuff comes out, like the robots! He also loves to party on Chobots so keep an eye out! Tiger Puff said... What are CP MODS? CP MODS are 'Moderators!' They keep club pegnuin safe! If someone is mean on Club Penguin they ban that penguin for a certain ammount of time! But if you mean CPG MODS, they are people like me...We help people with questions in the comments! Congratz Odan! Maybe they r having the PTTF in the PPA? A guess. Sorry I didn't mod more today; IT SNOWED @ MY HOUSE!!!!! BOO-YAH!!! Excellent question! CPG moderators, mods for short, monitor the comments. Their purpose is to answer questions, be encouraging, correct ppl, and make sure everyone is following the rules of CPG. You can be a mod too! Answer questions, congratulate ppl, make sure their following the rules, and help out if ppl need help. In time, Mimo will make u a mod! View the mod rules by scrolling down. They're on the right sidebar under the mod list. You may be up there someday! Good luck, and happy modding Tigger! People on club penguin who banns people who are mean, rude, swears, or any other mean thing. Maybe cuz it has to do with the missionnnnn? I think 6! Let's not add any more people! They ban people on clubpenguin! They help keep the site happy and safe! Idk, but if you mean cpg mod, that means someone who answers questions to help people. I don't think Mimo has one but other people probably do. If you are trying to be a CPG MOD, do NOT put CPG MOD next to your name unless you are correcting someone or answering. Maybe! Where you said "club penguingets turned upside down." its like April Fools' and cave party at the same time! Welcome to Club Penguin! And you're right - there has been pretty random things happening in CP! Like the time... never mind. mimo can u become a CPG mod and still post as a made up name?? You will some day... Lol, JK. Cp mods are people who help Clubpenguin. They ban bad guys and hackers, and I email them! Their real working place is in Canada, and they rock! Waddle on! That could be possible but if you look at the polls Penguins That Time Forgot wasn't doing so good, but good guess! What i don't like about the stage is that NOBODY ever says their line when they need to, sometimes someone says the entire script by themselves, some people just say all their lines too late or early, the stage is a REALLY bad idea, mostly because of that. they are making cave items because they are probably tell everyone about herbert he lives in a cave to remember! Mimo, I know it's off topic. But I would just like you to know that I really appreciated you picking me to be a mod. I was so overjoyed. I didn't think I thank you. So Thanks! i think there will be a FIRST EVER prehistoric penguin party and we all get a free costume even non members! cool, huh? Not really. The main question was CP mod, not CPG mod, so it referred to Club Penguin, not Mimo's site. CP Mods are the people in charge of banning penguins on CP. They can be called for by the golden M sign on the top right corner of you screen. This is also the way to become a secret agent. i think its got to do with that pile of rocks in the cave that look like a ockslide and there will be a cave part like in 2007 SWEET!i loved that party!!!!! Hey! Again... I am still following.... and I am still weird. I am pretty sure the members are, you, Kkk, Syka, Racet, Fluffygood, Polka, Sweetflame, and Karate Song... That is I think the most up to date list! Hope I Helped!